Hope began in 1873, when a railroad was built through the area. The town was named for Hope Longborough, the daughter of a railroad executive. According to the United States Census Bureau, the city has a total area of 10.1 square miles (26 km2), of which, 10.0 square miles (26 km2) of it is land and 0.1 square miles (0.26 km2) of it (0.60%) is water. Hope has many forms of local media. The Hope Star is the city's commercial newspaper. In addition, there are at least five local radio stations in and around Hope. The city is served by local television stations from the Little Rock and Ark-La-Tex markets. The only station in Hope is KTSS-LP, which broadcasts at low-power to southwestern Arkansas, including areas as far away as Texarkana. KTSS is affiliated with the Ion Television Network. It is one of the few Ion stations in Arkansas. The town is best known as the hometown of Bill Clinton. (See Bill Clinton childhood home.) At the 1992 Democratic National Convention in New York City, Clinton ended his acceptance speech by saying, "I still believe in a place called Hope." The city adopted this statement as its unofficial motto. The city converted its railroad depot to a museum about Clinton's life. Others from Hope include former White House Chief of Staff Mack McLarty; attorney Vincent Walker Foster, Jr. (1945–1993); former Louisville, Kentucky, Mayor David L. Armstrong; Gary Dee; former Arkansas Secretary of State Kelly Bryant, PGA golfer Ken Duke, actress/vocalist Ketty Lester, and actress Melinda Dillon. Country Music Hall of Fame singer Patsy Montana attended school in Hope. A leading figure in the restoration of nearby Historic Washington State Park in Washington, Arkansas, was James H. Pilkinton (1914–1994) of Hope, who served as president of the Pioneer Washington Restoration Foundation, Inc., from 1959–1960 and again from 1973-1990. In 1966, Pilkinton was the unsuccessful Democratic nominee for lieutenant governor, having narrowly been defeated by the Republican Maurice L. Britt, the running-mate of Winthrop Rockefeller, who won the first of his two two-year terms as governor that year. Pilkinton is interred at Rose Hill Cemetery. Former U.S. Representative Oren Harris was born in Hempstead County near Hope but was reared in Nevada County before he began his law practice and political career in El Dorado. Former Republican U.S. Representative from Michigan, Robert James Huber, is buried in Hope, but he did not live there. It was the hometown of his wife, the former Mary Pauline "Polly" Tolleson, a graduate of Hope High School. Another member of Congress born in Hope was Joseph Barton Elam of Louisiana's 4th congressional district, who served from 1877 to 1881 and resided in Mansfield, Louisiana. 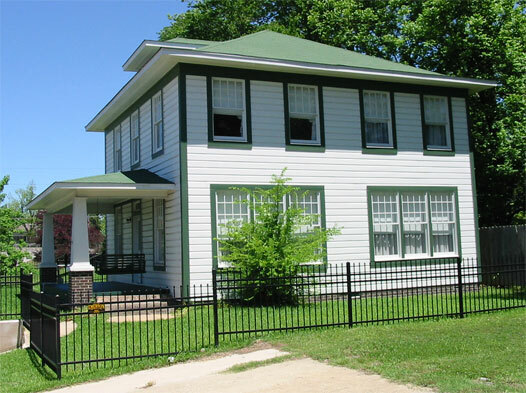 Hope is home to Henry C. Yerger, who established a school for blacks in 1895. ^ "Hope (Hempstead County)". Encyclopedia of Arkansas. The Central Arkansas Library System. http://www.encyclopediaofarkansas.net/encyclopedia/entry-detail.aspx?entryID=895. Retrieved 25 June 2014. ^ Harris-Smith, Stephanie (September 18, 2009). "Amtrak still rolling Hope's way". Hope Star (Hope, Arkansas: GateHouse Media, Inc.). http://www.hopestar.com/news/business/x1699588019/Amtrak-still-rolling-Hopes-way. Retrieved 2009-12-08. ^ "Texas Eagle And Heartland Flyer" (pdf). National Railroad Passenger Corp.. 2009-10-26. http://www.amtrak.com/servlet/BlobServer?blobcol=urldata&blobtable=MungoBlobs&blobkey=id&blobwhere=1249200491102&blobheader=application%2Fpdf&blobheadername1=Content-disposition&blobheadervalue1=attachment;filename=Amtrak_P21.pdf. Retrieved 2009-12-08. This page uses content from the English language Wikipedia. The original content was at Hope, Arkansas. The list of authors can be seen in the page history. As with this Familypedia wiki, the content of Wikipedia is available under the Creative Commons License.